I t’s Friday and that means it’s time to write for five minutes, no editing, no backtracking, no overthinking. Lisa-Jo provides a prompt and in this community we write and then we encourage one another. So link it up, friends, and share the love. The wide wood planks are the color of honey and just as sticky under the the baby’s chair but they still sparkle through the grime when the summer sun hits full-force at five o’clock in the afternoon. Yellow-gold walls disguise crayons and remnants of art-displaying scotch tape and the baseboards are witnesses to three babies who have learned to scoot and crawl and walk across the floors of a home that was never meant for four. A house that was never meant for four. Because this home certainly was. There’s a garden plot he and the girls tilled by hand and there are splatters all over the carport because I let them help paint our “new” table. My fridge has never opened all the way because there’s a wall in the way and sometimes one can’t get through the door for all the babies and shoes and kittens. It’s so small here that my mother told me when we moved in that I could never have another baby in this home. 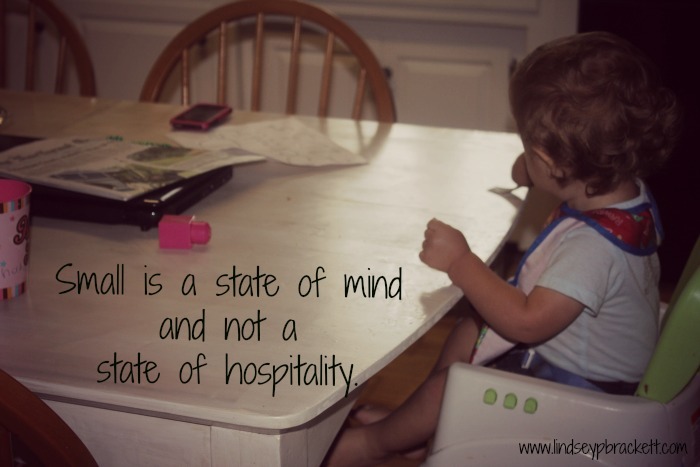 And I’ve learned that small is a state of mind and not a state of hospitality.